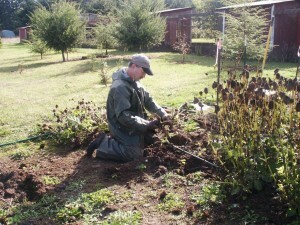 Before you dig up your dahlia plants, if at all possible let them go dormant for a few weeks. 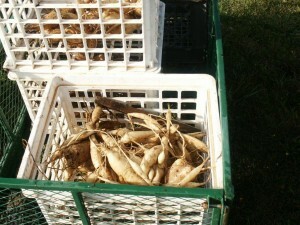 This allows the roots to harden off for the winter and improves their shelf life in storage. Start by removing your supports. Using a digging fork or shovel, start around ten inches away from the stock and loosen the soil around the plant. 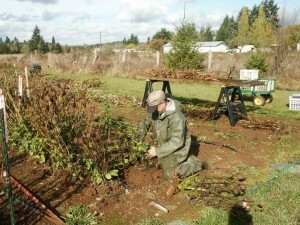 Then with your digging tool in one hand pry up the plant, while pulling the plant up with the other hand to remove it from the ground. If you are growing dahlias in heavy soil like we do you may want to loosen the soil around the plant and then put both hands under the roots to pull the plant out. 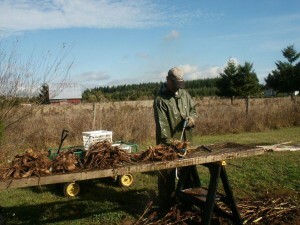 Pulling the plant out this way will lessen the likelihood of breaking the tuber’s necks. When digging your plants remember to keep the identifying tags with them. In the above photo you can see the stake in the bottom middle of the picture. 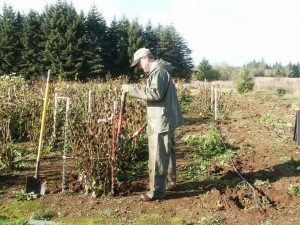 This stake with the dahlia’s name on it will stay with the dahlia until the tubers are put into storage tubs. 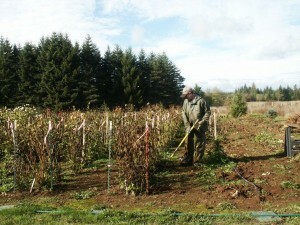 After pulling the plant from the ground, remove the excess dirt and cut the stock away from the root clump. Keep all of the same varieties together during harvest. This will help lower the risk of getting your varieties mixed up. In the above photo you see the wash rack that we built. This gives us the ability to wash tubers while standing up right. It is made with a frame of 2X3 boards and a wire mess of 1” X 2”. This is placed on sawhorses in the garden so that when we are washing the tubers off the dirt stays in the garden. 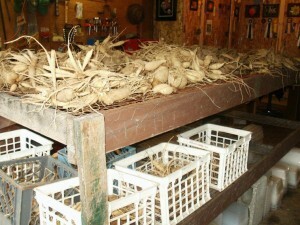 Also notice under the wash rack the stocks of the tubers. They help replenish the nutrients and improve the texture of the soil. To conserve water we suggest using a nozzle at the end of the hose that shuts off when you are not washing your root clumps. It should be an adjustable nozzle. You do not want too much pressure or you can damage the tubers by removing their skin or breaking their necks.